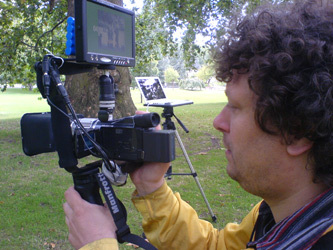 Thorsten uses his video and animation experience in a number of projects relating to Human rights and social issues as well as to create campaign films and short documentaries for charities. Commissioning bodies and companies include Postcolonial Films/Save The Children (Norway), Postcolonial Films/Amnesty International (USA), South London Gallery/Louis Vuitton, The William Morris Society, ACAVA Arts Charity and The European Shakuhachi Society. 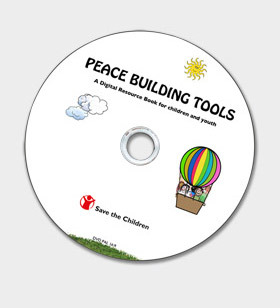 Creation of a series of 10 explanatory animations/video shorts based on workshop tools developed by Save the Children to assist children and young people, who had been traumatised by their experiences in war and conflict zones, to reintegrate back into society and become active members of the reconciliation and peace processes. 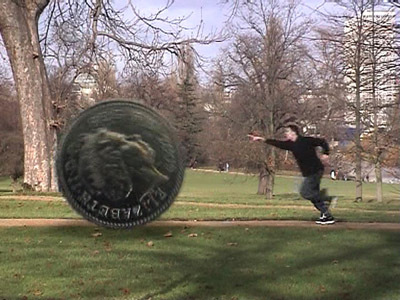 The resulting animations were combined on a DVD and will be used in various countries throughout the world. Editing a campaign video for the ‘International Day of Victims of Enforced Disappearance’ to feature on the US website of Amnesty International. Directing a short film and promotional trailer for launch of the Louis Vuitton’s Young Arts Project with young people of the South London Gallery’s Young Peoples Forum. 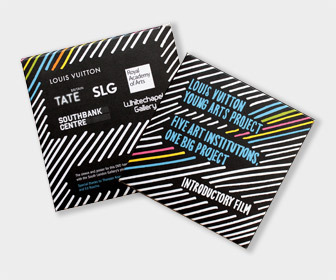 The project was managed by the South London Gallery and realised in association with Royal Academy of Arts, Tate Gallery, Whitechapel Gallery, and Southbank Centre/Hayward Gallery. 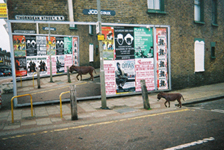 The project included a series of workshops and gallery visits to five of the main London public galleries. The film combines footage of the gallery visits, discussions about the art seen and material generated in the associated workshops. [click image to play video] For full version (15') please click here. 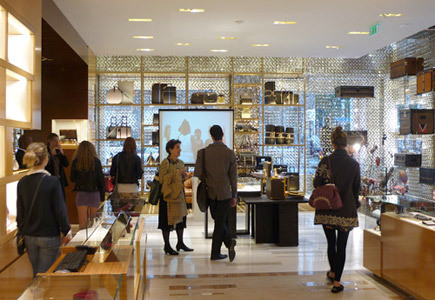 Filming the workshop with Charlie Dark, South London Gallery Screening of film, Louis Vuitton Shop in Bond Street, London. Directing the live audio recording and creating the design for a CD of William Morris’s play The Tables Turned or Nupkins Awakened - A Socialist Interlude. Morris’s only play was originally performed for the first time on the 15 October in 1887. 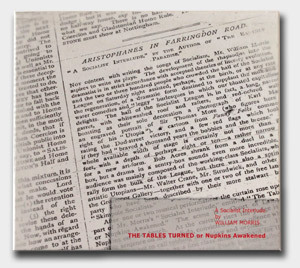 Having not been performed for about a century, on 2 May 2010 the play was staged again for a one-off performance by The New Factory of the Eccentric Actor at Kelmscott House in London. The audio CD was created to capture and archive that performance. Short extract of The Tables Turned or Nupkins Awakened – A Socialist Interlude. Directing and editing documentary & promotional short videos about the European Shakuhachi Summer School in London in 2011 held at the School of African and Oriental Studies (SOAS), University of London. Creation of three short promotional videos about the preparation and planting of a new grape variety in the organic vineyard Domaine Rouaud near the Pyrénées in Southern France. 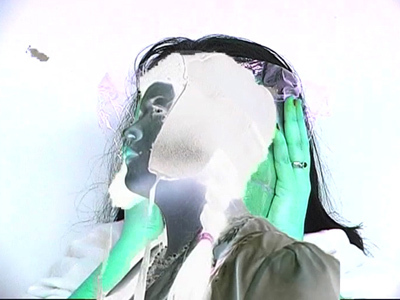 Thorsten’s interest in cinema and the moving image has also led him to work on a number of video/film workshops within the educational and communal contexts. These projects include working on outreach or education programmes of leading London public galleries, as well as in schools and community centres. Short demonstration of the workshop processes. 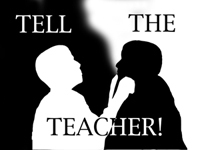 Schools: Haberdasher's Aske's Hatcham College, St. Thomas the Apostle College, Walworth School. UNCUT - video stills from the educational workshop at the Serpentine Gallery. 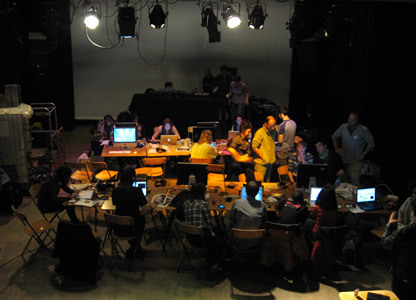 The StrangerFestival and its annual award event in Amsterdam was a two-year project over 2008 and 2009. It was a celebration of young people’s video-making that also involved: a training academy, video workshops throughout Europe and a travelling exhibition to promote all the resulting videos. The Stranger Festival, Amsterdam. Video editing session. Workshop at East Potential, Stratford. Sample video: A Life without Art by Courtney Vizard. An additional workshop ‘Old Story – New Me’ was conducted in Amsterdam in association with the Netherlands TV archive. (1 of 4 workshop leaders). 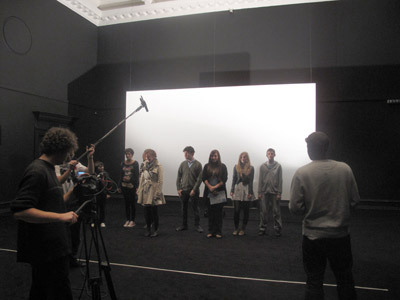 The films created by the participants can be viewed here. ‘Old Story – New Me’ workshop at the Stranger Festival, Amsterdam. ‘social cohesion’ within the area of Pollards Hill and interviews with community leaders and community workers were conducted and the activities of the community documented. 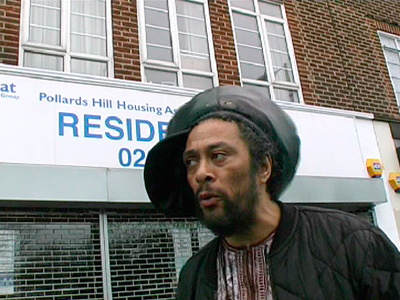 The film was done in collaboration with the Pollards Hill Community Centre members. A 12-week project working with a weekly afternoon school group at Burlington Danes Academy to create a short documentary film about the activities at their school and the new building extension being constructed. 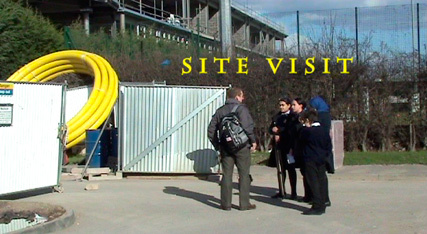 It included a building site visit and various interviews, e.g. with the schools’ principal and the architect, which were conducted by the pupils. 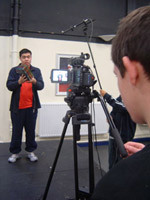 A video documentary course held with a group of autistic children at Paddington Arts Centre. The workshop was conducted over a 10-week period with weekly sessions to facilitate the participants to develop an idea, structure and also to edit the own personal short video around the title 'My Life'. Green-screen set-up, samples of 3-D 'environment' and models. 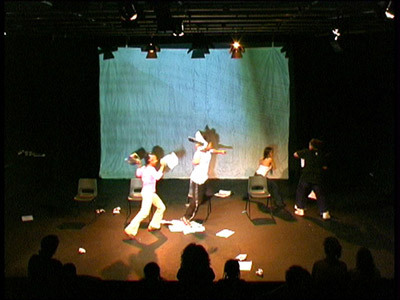 The Key Street projects were an opportunity for young people (13-19 years old) to take part in a week-long performance arts project combining dance, music & film working alongside arts professionals. They created the choreography, music, lyrics and video imagery and explored issues, exam stress, going out and phone mugging through dance, film and music to tell it their way. 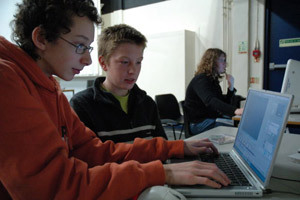 The project was held in 2003 and 2004. Key Street was managed by The Royal Borough of Kensington and Chelsea Libraries and Arts Service in partnership with The Royal Borough of Kensington and Chelsea Community Education Division. 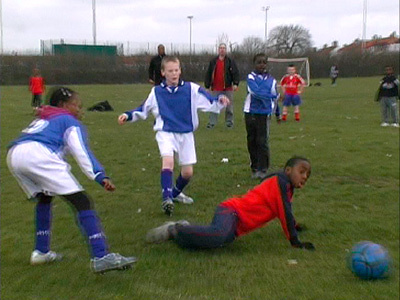 Assisted by workers from West Chelsea Play Space and Chelsea Detached Youth Work Team. 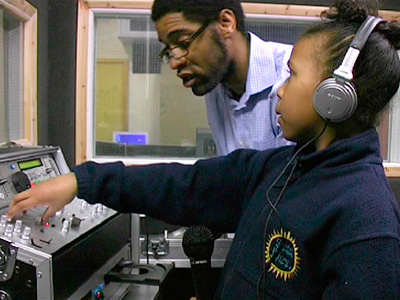 Main funding was provided by LEAP through the Arts Council England, London. 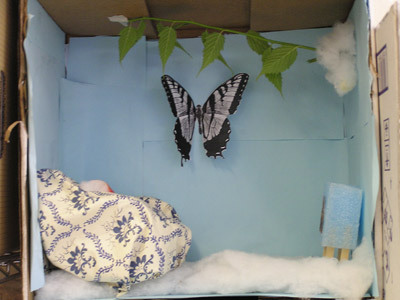 Examples of images created in the workshops. From time to time Thorsten creates documentations of events within the visual and/or performing art context. 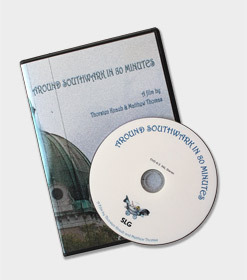 These documentations can be converted for various formats and archival platforms, e.g. HD video, webfriendly formats and hardcopy versions on DVD discs. Charity concert documentation and DVD for Folk Music Japan: a celebration of Tohoku at the School of African and Oriental Studies (SOAS) in London. Creating a DVD showreel for the South London Gallery to showcase the gallery and inform about the planned building extension. It involved conducting a couple of short interviews with contemporary artists as well as the design and authoring of the DVD. Documenting the author talks and events at Pinter & Martin publishers. The talks were by Gabrielle Palmer, Carlos González and Frederick Leboyer. 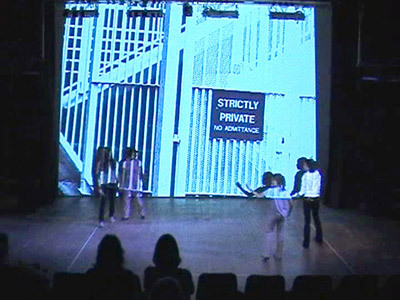 Producing video documentation of contemporary dance performances in DVD and online formats. Clients included among others Chinatown Arts Space for Dance Now (UK/China) with performances at the Linbury Theatre (Royal Opera House) and Lilian Baylis Theatre (Sadler’s Wells), and Step Out Arts showcase at Greenwich Dance Agency. Thorsten also likes to make the occasional book, poster or CD cover design. Recent jobs include creating the CD cover concept, photography and design for the promotional CD Vers L’Aube Enchantée of French flute and guitar duo Emmanuelle Rouaud & Pascal Pacaly. The book jacket design for Miller, Bukowski & Their Enemies – Essays on Contemporary Culture by Guillermo O'Joyce. Published by Pinter & Martin, London. as well as the book jacket and theatre poster design for Martin Wagner’s’ play ‘The Agent’ at Old Red Lion Theatre & Trafalgar Studios, London. Other digital services include producing special subtitles, called soft-titles and operating soft-title projections for cinema screenings of 35mm or 16mm prints. Often screenings of foreign language film prints, which have been never or rarely screened before, use the soft-titling method to make them accessible to a wider audience as no print with burned in subtitles is in existence and the usual laser burn-in process for titles would be destructive of the original film print. Most recently Thorsten provided soft-titling for the complete 2013 and 2012 Peter Nestler retrospectives at the Goethe Institute and Tate Modern (2012) in London. 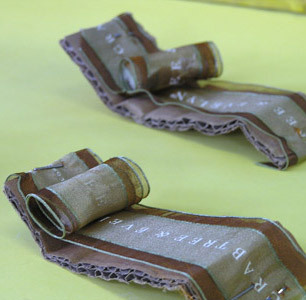 In 2011 he provided the soft-titling service for ‘Celluloid Curtain’ - 50 years after the wall, a Film Festival organised by the Goethe Institute and held at Riverside Studios, London. Clients have included Tate Modern, Goethe Institute, Barbican Centre (e.g. Mexican Film Festival, Portuguese Film Festival), Ciné Lumière (Institute Français), British Film Institute (BFI) in London. Thorsten creates english soft-titles for films in any language and translations can be arranged if no english subtitle script or dialogue list exists already. Please feel free to drop me a line, whether you need a short campaign video, a longer documentary film or a video or photographic documentation of an event, or just have a general enquiry. I will be happy to try to help and discuss with you the details of your project requirements. Often my rates are flexible and I can work either to a fixed project fee or daily/hourly rate.